Settlement at Tarvin dates back to medieval times. Today the high street is in a conservation area and there is an award winning Community Woodland to the south of the village. The Tarvin Village Design Statement was put together by members of the community and shows the importance of the views over the countryside towards the mid-Cheshire ridge and the materials to be used in any new development. It also explains a wish to extend the Community Woodland as far as Austin’s Hill. Our Strategic Land and Planning team signed an option agreement on 4.6 hectares of agricultural land along Tarporley Road in March 2010. The site did not have a planning allocation and was designated as ‘open countryside’ in the Chester District Local Plan. During the planning phase we consulted with local people, worked with the parish council, and held meetings with the Tarvin Woodland Trust, the Tarvin Community Youth Group and Tarvin Civic Trust to present and discuss our proposals for the site. In October 2011 about 180 people attended two public exhibitions at the Tarvin Community Centre that we had advertised locally, in newspaper adverts and leaflets posted to over 1,200 nearby homes. We also set up a dedicated website and telephone number to enable more local people to have their say. We received support from and developed good relationships with different local groups and the parish council. We were complemented by both the Cheshire West and Chester Planning Officers and the Strategic Planning Committee on our thorough community engagement. The parish council, civic trust and woodland trust all wrote letters of support for our planning application, and the ward member stood up in favour of our proposals at the planning committee. The outline planning application received a positive recommendation from Chester West and Chester Planning Officers before it went to the planning committee. In March 2012 the planning committee unanimously decided to award us outline planning consent. Our regional office, Taylor Wimpey North West, carried out further community engagement before submitting a reserved matters planning application in August 2012. We were granted full planning approval in December that year; again the committee’s vote was unanimous. We listened to the local people and made changes to our proposals and the development layout based on their suggestions. 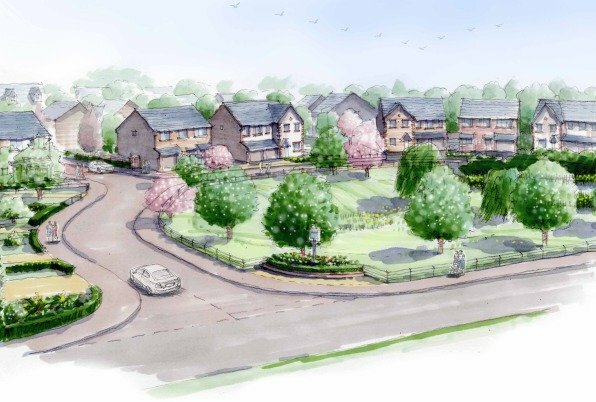 These included: making the village green a more prominent feature; reducing the number of larger four- and five-bedroom homes; removing a hedge along Tarporley Road to give visitors a view the proposed new village green; and promoting a 40 mph speed limit for the length of Tarporley Road. The parish council wanted to develop additional car parking in the village centre. Although separate from our site, we helped the parish council to identify suitable land and open negotiations with the landowners. This land has now been put on the market for residential and car parking uses. As a result of our meeting with the youth group we also offered to make a financial contribution towards building a BMX track on open space elsewhere in the village. Suggestions to expand the development area came from the community engagement process. We negotiated with the landowner to buy the field that lies between the main site and the A51 to the south so that we could extend the Community Woodland. The most appropriate way to manage the Community Woodland Trail in the long-term is being discussed. We also brought a third piece of land under our control, which is on the eastern side of Tarporley Road. This land offers a suitable habitat for us to relocate the great crested newt population from the main site, which will allow us to change our design for the new village green in line with the community’s wishes.